The MWCA experience is all about innovation and experimentation in the mobility landscape. When we talk about Mobile World Congress Americas, we talk about the trend-setting technologies that are creating ripples in the mobile industry of today and setting the ground for more to happen tomorrow. Web and mobile app development at MWCA revolves around the groundbreaking technologies changing the way businesses operate, engage with their customers, introduce digital transformation in their enterprise, and so on. For anyone looking to get IT consultancy at MWC Americas 2018, September 12-14 could be their best chances at receiving consultancy from the best mobility solutions providers from all over the world. IT companies and businesses offering startup solutions can be found at the MWC Americas 2018, revealing their best works in cutting-edge technologies that solve the most pressing industry challenges. MWC Americas is the largest mobility technology event which is Too Good to be Missed as that attracts visitors and exhibitors from more than 100 countries and territories. With over a 1000 exhibitors and 25,000+ attendees, the event garners the attention of media analysts and stays in the trending NEWS in technology well after it gets wrapped up. Application Development companies that juggle with technologies such as Augmented Reality, Virtual Reality, wearables, Artificial Intelligence, Machine Learning, Big Data – are a regular at Mobile World Congress Americas. The event brings together mobility enthusiasts and learners from all industries who want to make life simpler for their customers by employing technology for their benefit. Healthcare, Startups, Retail, E-commerce, and Consumer are some industries and verticals who benefit from learning about the latest trends and innovations in the mobility space. Mobile World Congress Americas gives them the platform and community where they can discuss challenges and carve solutions. Augmented Reality/Virtual Reality – The reality-redefining technologies find a lot of applications in leading industries today. People are making buying decisions for furniture pieces for how well they fit in their home’s interior by using these technologies. Learning experiences are becoming more immersive for professional trainees, such as in the medical and healthcare sector. Statistics predict that the two technologies could drive a market share of $108 billion by 2021, with AR taking the bigger share of $83 billion. With such a promising future, these technologies will continue to dominate the MWC Americas 2018. And, the coming end-of-decade may find them in more useful areas than gaming and entertainment. The Internet of Things – The connected world of hardware and software is here. When Garner predicted a whopping 26 billion connected devices by 2020, it included everything from toys, sports equipment, power sockets, LEDs, and other home appliances we want to stay in control of when we are not around. Smart things such as these will then be regularly in touch with us through our mobile phones and wearables, thus opening a plethora of applications for innovation in mobility for industries and businesses. Navigating the world with comfort is our ultimate aim with the IoT in mobility solutions. Startups and established giants such as Microsoft, Google, and Amazon are equally in desperation to be the first ones in their space to bring the technology to users. Blockchain– Market participants keep track of their transactions in the digital space through a digitized and decentralized public ledger sans any record-keeping and traditional management of transactions. Introducing security and integrity of data to the otherwise insecure arena of financial transactions, Blockchain has become the most sought-after technology for implementation today. Moving beyond the concepts of Cryptocurrency, the Mobile World Congress Americas 2018 will witness mobility solutions based on Blockchain- tackling transparency and record-keeping challenges in numerous industries. Wearables– As wearables are set to become the uniform in many enterprises, applications for the devices will see a boom in the coming years. Wearable devices have become a hit for fitness enthusiasts, but enterprises are looking for more ways to bring them into implementation. Field Service companies are trying to keep track of their remote workforce through wearable devices and the applications installed on these devices. As the trend has set in more prominently, MWC Americas 2018 is expected to be a bit more about wearables than it has ever been before. 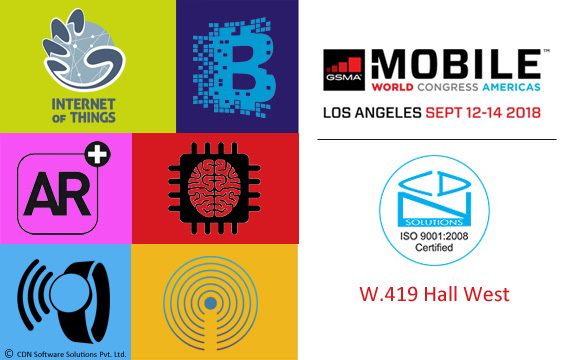 Mobile innovation will be at the heart of the MWCA 2018 as IT enthusiasts, service providers, consultants, and tech-employers come together to fathom the future of technology in mobile devices. Mobile enterprise solutions and services are witnessing a shift in the way they were developed and exploited. Businesses are changing the way they operate and customers are changing how they interact with these businesses- thanks to innovations in mobility technology. CDN Software Solutions is coming to Mobile World Congress Los Angeles. Since all deliberation about software development at MWC Americas would revolve around the latest buzz, we are set to bring our best services for businesses looking to partner with a team of tech-enablers. With over 2000 IT products done and delivered, CDN Software Solutions stays a reliable partner for businesses looking to solve their industry’s most challenging problems with technology. As an exhibiting IT company at Los Angeles, we invite you to discuss your challenges with the most credible IT outsourcing company at MWCA ’18. Consultancy – We can help you understand which technology would work best to solve your industry issues. We can also carve out an IT strategy for you to follow to bring in a digital transformation in your enterprise with mobility as a driver. Application development – With extensive experience in all leading technologies and trends, we are confident to put any challenge aside and replace it with a suitable cutting-edge mobile solution. Hire resources – Our pool of talent can help you build a mobile solution- be it a customer-facing mobile app or a back-office enhancing solution. We have the best IT minds on our team, available to help you with the tech support you need. At CDN Software Solutions, we believe that the first and foremost phase of application development is requirement understanding. Thus, we invite you to our booth Hall West Stand W.419.